How topsy-turvy and mad life is; like a circus! About just enjoying life while you are here! About how we intend to build a life but can create monsters! About getting out and having fun! 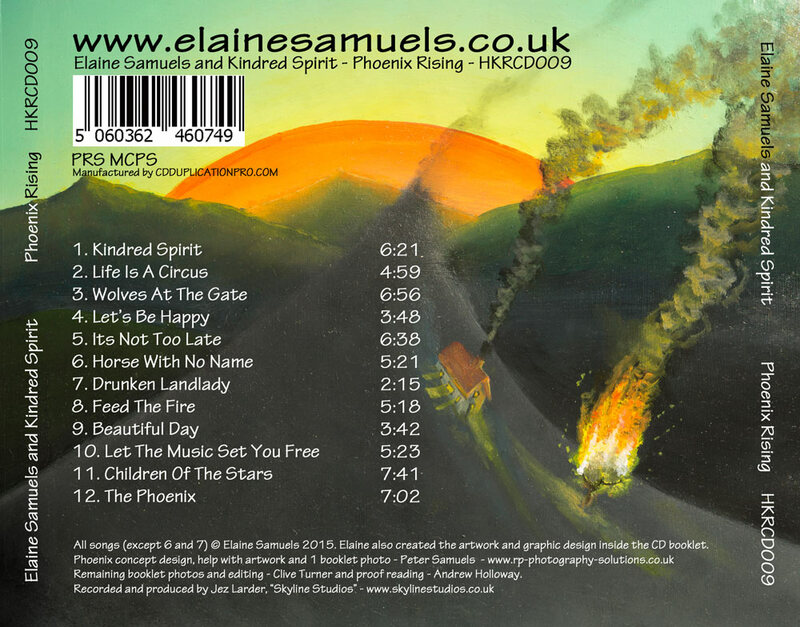 "Honestly, I have found Elaine Samuels And Kindred Spirit one of the best Folk-Rock acts in activity in the U.K.! 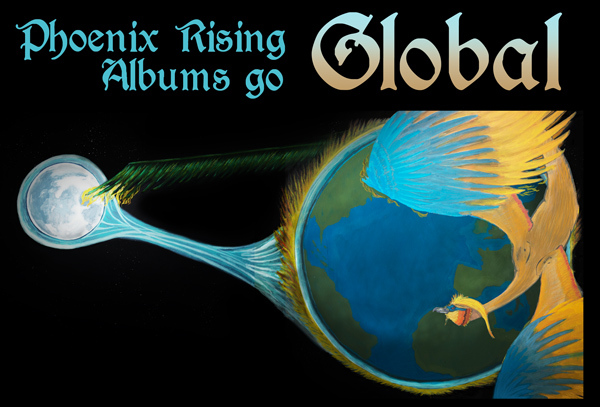 Their amazing album, “Phoenix Rising”, is full of the finest Folk-Rock songs around, being indispensable for fans of: “Curved Air”, “Fleetwood Mac”, “Pentangle”, “Fairport Convention”, “Steeleye Span”, “The Moody Blues”, “Jethro Tull”, “Lindisfarne”, “Clannad”, “Solstice”, “Blackmore’s Night”, “Willowglass”, “Mostly Autumn”, “Estampie”, “Faun”, “Garmarna”, “Schandmaul”, “Skyclad”, and so on". Vocalist Elaine Samuels has a fine voice that comes to its best when using a softer and more ethereal vocal style...the talent of violin player Gavin Jones merits a particular mention, so those fond of a vibrant violinist will really enjoy what he adds to the songs on the album....those with a strong interest in both folk rock and progressive folk rock should find this CD to be worth checking out. 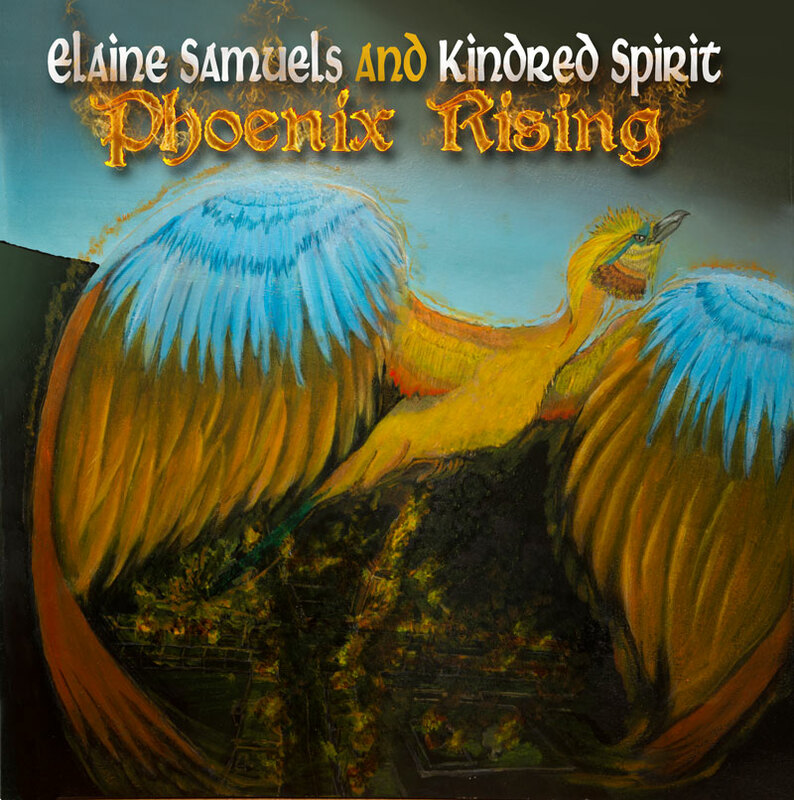 Elaine Samuels and Kindred Spirit describe themselves, accurately, as a prog (folk) rock band. It is prog rock with folk tinges, similar to mid-period Mostly Autumn or Solstice, but without Andy Glass' brand of guitar fireworks. This is a five-piece band led by Elaine Samuels, who writes all the original songs and who also sings and plays the guitar, both electric and acoustic. The prog rock on Phoenix Rising is very much song-based, and those songs are eminently melodic. So much so, that after two plays I found myself humming them on odd occasions, wondering where on earth I had heard these tunes before. They have both a timeless, and a modern edge to them. I have a love/hate relationship with the Folk based aspectof the progressive music scene. When done well it can be outstanding but when it is done poorly it feels too inward, regressive and inaccessible to my ears. I will start by saying this album is not in the latter category and is very close to the former. Elaine has long charmed audiences with her progressive folk rock. Kindred Spirit is a remarkable track, and also of note for lovers of adventurous Americana is a vivacious cover of A Horse With No Name with an unexpected English jig setting. Opening song “Kindred Spirits” certainly contains the ethereal quality you might find in early Moody Blues. vision … creating a sort of divine salvation. We also heard the jaunty number “The Phoenix” with its trotting pace and pizzicato strings. This song seems to be about facing all that is left … (in other words, the “Ashes” ) trying to make sense of them … before you can even hope to fly again. Finality and sadness has to be visited upon us before we can hope of being re-born. This song reminded us of Renaissance (the rock band) around their ‘Novella’ period. It immediately draws the listener into enormous depths – the pay-off is complex, exciting and invaluable. This is a creative, progressive folk-rock album with some extraordinarily beautiful songs and a host of imaginative and wonderfully crafted ideas. Written for our generation. Nice production fab playing, songs and liked the cover of America's "Horse with no name". I'm liking the album a lot, track five "It's not to late" stood out on first hearing. I can honestly say it’s a terrific album and well worth adding to your collection. Music Reviewer and Band Leader for "Clayson and The Argonauts"
Based presently where sarf London bleeds into genteel Surrey, Samuels, vocalist, guitarist and composer of all but two of the dozen selections here, appears to have the same all-powerful hold over her four principal accompanists as, say, Ray Davies over The Kinks - a group that has left its mark on her output. However, hard listening to this third CD offering reveals more obvious elements of Pentangle and the post -1966 Moody Blues. Yet, if you’re struggling for a more general reference point, it steers close to a musical genre of the mid - to late -1960s that, often by fusing orthodox beat group instrumentation with orchestral woodwind and strings, created a downbeat, autumnal mood of ‘beautiful sadness’ within the space of a chart-directed single. Think ‘Walk Away Renée', ‘Waterloo Sunset’, ‘Time Of The Season’…you get the drift. Elaine’s approach, however, is more discursive with the shortest vocal track around the four-minute mark, namely, 'Beautiful Day’. Tellingly, though repeated spins puts other items into sharper focus, this is Phoenix Rising’s most instantly familiar opus unless you count what amounts to an upbeat improvement on America’s ‘Horse With No Name’ million-seller of 1972 - and traditional ‘Drunken Landlady’, on a par with ‘Drowsy Maggie’ and ‘Down The Broom’ as an end-of-cèilidh raver. As in-yer-face, ‘Feel The Fire’ is lacquered with electric six-string block chords, courtesy of Elaine herself - though a more conspicuous instrumental star of the entire collection is violinist Gavin Jones, more David La Flamme (of It’s A Beautiful Day) than Dave Swarbrick. Ministering more unobtrusively to overall effect, however, is new recruit Les Binks, once drummer with heavy metallurgists Judas Priest, all over a frequently daring listening experience that holds your attention throughout. Prog (folk) rock band, "Spriggan Mist" have also just released a new album, called "Myths and Legends". Baz and Elaine were chatting about how they produced their albums, when they decided they should do an album swap and give each other an album review! 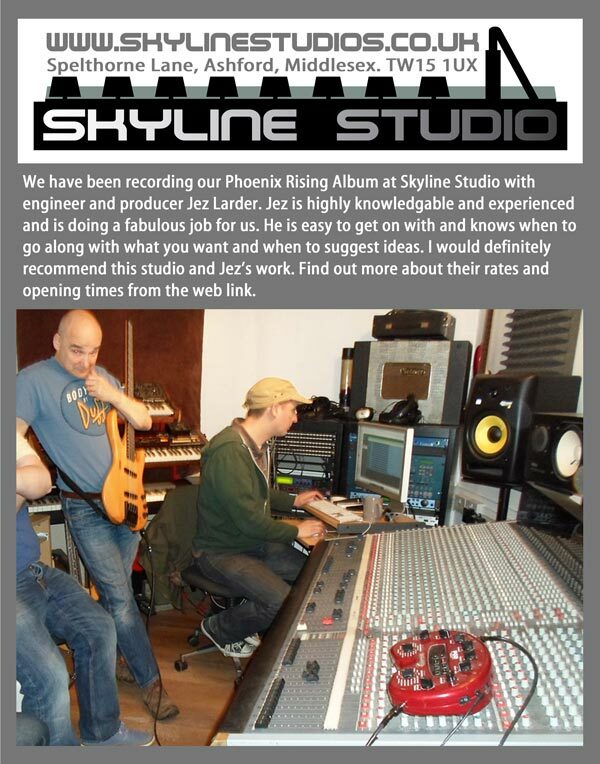 Baz's review of the "Phoenix Rising" album is particularly long and comprehensive, so I have put it on another page along with the review that I gave the new Spriggan Mist album. 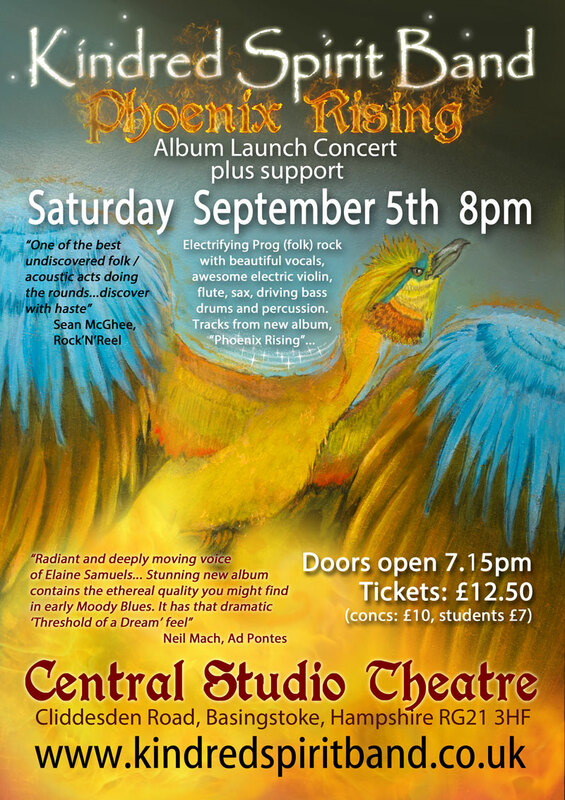 Click here for Baz's review of "Phoenix Rising"
Click here for Elaine's review of "Myths and Legends"